The company Habitrail distributes transparent plastic modules, which can be set together to maze-like hamster cages. For this sculpture only parts of the old system were used, which were availale in 1999. From these modules an Habitrail example was set together, as you would find in the brochure: A Habitrail Park equipped with a “mansion, suite, spin around, sky-restaurant, solarium, big-wheel with hide-out, snack bar, flame tunnel” as well as other diverse trails, “tee connector, U-tunnel and curves”. The Habitrail cage is completely colourfull illuminated from below by 66 small light bulbs. Following the principle of a wandering light, the point of light is animated. It moves either as a ball, bouncing back from a the walls, just like in the first video game Pong, or is simply wandering around coincidentally. The lights are installed under transparent surfaces with a radius of 5 cm. Without doubt, this setting does not suits the natural habitat of a rodent and is absolutely not appropriate to the needs of a hamster. The habitrail park fascinates due to its pure projection of human imaginations, imposed upon animal kingdom. It reminds of miniatures of a Disney World, going along with swimming pools, playgrounds, or technique centers in a futuristic design. But, in difference to the real-world architecture, this park is a cage. 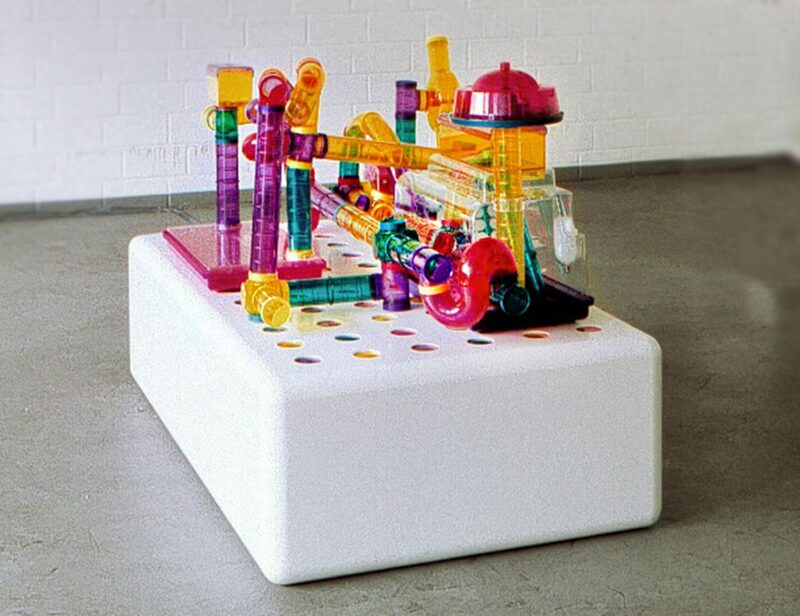 The hint in the title of this work, using the word “biosphere”, directs the view towards a sculpture, as a model of a closed-circuit system where the educational principle of recognition, thinking, acting, as well as romping about, fun and phantasy, follow the laws of playing in a self-sufficient circulation. B1OTOPE takes up the most remarkable attraction, on which most computer games are built: symbolic describted, labirinthic structures. The mouse cage in connection with video games is regarded as a conversion of virtual architectures from the game world, this time in real 3D. There are here no direct references to existing games. Besides, there are no particular game contents which are shown, apart from the fact, that a mouse, like a Tamagotchi, needs to be feeded.